ClubOrlov: Putin to Western Elites: You Flunked! Previously, the game of international politics was played as follows: politicians made public pronouncements, for the sake of maintaining a pleasant fiction of national sovereignty, but they were strictly for show and had nothing to do with the substance of international politics; in the meantime, they engaged in secret back-room negotiations, in which the actual deals were hammered out. Previously, Putin tried to play this game, expecting only that Russia be treated as an equal. But these hopes have been dashed, and at this conference he declared the game to be over, explicitly violating Western taboo by speaking directly to the people over the heads of elite clans and political leaders. There is still a chance to construct a new world order that will avoid a world war. This new world order must of necessity include the United States—but can only do so on the same terms as everyone else: subject to international law and international agreements; refraining from all unilateral action; in full respect of the sovereignty of other nations. Seated between Hamid Karzai, the former president of Afghanistan, and Jack Ma, the billionaire head of the Chinese giant Alibaba, Putin emphasized that the modern world is a mindbogglingly intricate and complex place, full of unsolved problems and contradictions. On the one hand, there are virtually medieval, tribal societies such as Afghanistan, with their own traditions of tribal democracy and not amenable to positive change from the outside (what Karzai termed “John Kerry’s democracy”); on the other, the ubiquity of the internet, of instantaneous global communications and rapid progress in areas such as robotics and machine learning, epitomized by Jack Ma, offered both dangers and opportunities. But Putin the stern taskmaster emphasized that “All disputes must be resolved in a civilised manner… We are firmly convinced that even the most complex knots… must be disentangled rather than cut.” This requires intricate local knowledge, the capacity for patient diplomacy and a reputation for fair dealing—all of which Washington has either sacrificed on the bonfire of its own vanity, or has never had to begin with. [The Americans] started building a plant on the Savannah River Site. Its initial price tag was $4.86 billon but they spent almost $8 billion, brought construction to 70 percent and then froze the project. But, to our knowledge, the budget request for 2018 includes $270 million for the closure and mothballing of this facility. As usual, a question arises: where is the money? Probably stolen. Or they miscalculated something when planning its construction. Such things happen. They happen here all too often. But we are not interested in this, this is not our business. We are interested in what happens with uranium and plutonium. What about the disposal of plutonium? Dilution and geological storage of the plutonium is suggested. But this completely contradicts the spirit and letter of the agreement, and, most important, does not guarantee that the dilution is not reconverted into weapons-grade plutonium. All this is very unfortunate and bewildering. To be fair, designing and building such a reactor is a tricky task; many have tried, but only Russia has succeeded. The Americans lack the knowhow, but are too proud and embarrassed to ask for help. On the topic of ethnic separatism, which is currently gripping many parts of the world, Putin’s rebuke was blunt: “You should have thought about this before,” when you engineered the confiscation of Kosovo from Serbia and turned it into a NATO military base. It is no use feigning umbrage now that Crimea has budded off from the Ukraine and joined Russia, or that Eastern Ukraine is refusing to bow down before the regime in Kiev, or that Iraqi Kurdistan has voted for independence (but failed in its bid due to lack of support from anyone except Israel). At one time the apologists for globalisation were trying to convince us that universal economic interdependence was a guarantee against conflicts and geopolitical rivalry. Alas, this did not happen… Some do not even conceal that they are using political pretexts to promote their strictly commercial interests. For instance, the recent package of sanctions adopted by the US Congress is openly aimed at ousting Russia from European energy markets and compelling Europe to buy more expensive US-produced LNG although the scale of its production is still too small. During the Q&A that followed his speech, Putin elaborated that “Terrorism has deep roots in the injustice of the world, among the underprivileged peoples and religious and ethnic groups, and in the absence of basic educational systems in many countries. Absence of good basic education is one of the things that nurtures terrorism.” The West’s heavy-handed tactics, which have recently made Syrian Raqqa look like Dresden at the end of World War II and caused many thousands of civilian casualties in Iraqi Mosul, create terrorism even as they are pretending to destroy it. Much else was said—on the situation in the Ukraine, on North Korea, on how rapidly the situation in the world is shifting and developing and on the grave danger such instability poses to the world. For that, I encourage you to read the entire speech. But what is key to understand is that the era of Russian forbearance in the face of Western slights—of “turning the other cheek”—is now definitively over. 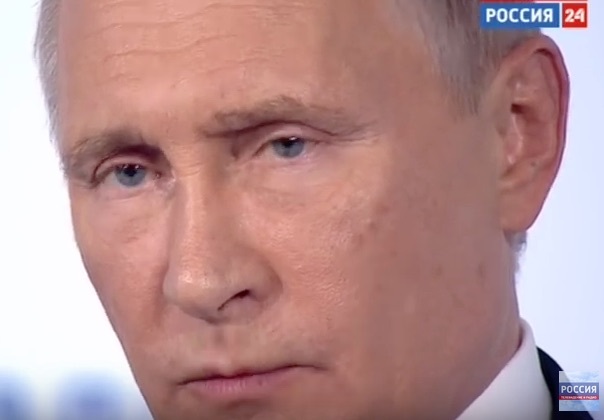 When asked whether American lack of ability to pursue arms control is sending the world back to the 1950’s, Putin retorted: “We’re not gong back to the 1950s, we are being sent back to the 1950s” but that if the Americans wish to cancel any arms control agreement, Russia’s response will be “immediate and symmetric.” I hope that some of you remember what the situation that developed in the 1950s led to: the Cuban Missile Crisis, when the world came so close to nuclear annihilation that only a happy accident prevented it. We can only hope that the junta of armchair generals with whom Trump has surrounded himself remembers that too, and that they don’t get suicidal on us. There is certainly little hope that the Washington establishment understands the gravity of the situation, enthralled as they seem in the question of whether to impeach Trump for being a misogynist and a racist, or to lock up Hillary Clinton for being a crook. Nor is there much hope for the American population at large, most of which is in rapture over new revelations about all the pretty girls Harvey Weinstein may have molested. Asked whether Trump is unpredictable, Putin responded that “Americans are unpredictable.” All we can hope for is that the Russians, along with their many friends and allies, continue to be professional, calm, careful and measured in their responses to random American flailing, and that Americans manage to maintain the presence of mind to keep their idiotic reality show, with their reality-show-host president, from turning into a snuff film. I now turn it over to Putin. It turns out that some of our colleagues think there are “good” fighters for independence and freedom and there are “separatists” who are not entitled to defend their rights, even with the use of democratic mechanisms. In Russia, on the contrary, the process was completed on September 27 of this year. By doing so our country has made a significant contribution to enhancing international security. By the way, the western media preferred to keep quiet, not to notice it, though there was one fleeting mention somewhere in Canada, but that was it, then silence. This chemical weapons arsenal, which the Soviet Union had stockpiled, would have been enough to destroy life on the planet multiple times over. Putin can’t be a contemporary world leader. e sounds too much like an adult. Yes, it’s quite embarrassing being an American these days. Actually, has been for much too long. It is obvious that Putin took these words right out of Trump’s mouth. The same sober outlook on the world and humanitarian gestures can be observed in every tweet of the great American pumpkin! You may have a point, but the info flow has to be the other way: Putin-to-text, machine translation, the twitterizer to fit it within that 8th-grade vocab limit, then straight Trump's twitfeed. Maybe Trump is a Kremlin twitbot. Who knew? I can't imagine what it would be like to live in a country where the political elite addressed its citizens like adults. In 2008, I was impressed by a few of the speeches Obama gave that felt like minor league versions of this speech by Putin, but after the inauguration speech it was a swift return to the fortress of evasion, lies and banalities. Also, I wonder if sports talk shows rose to prominence partially as endemic lying and condescension became the norm in American political life. I personally cannot stand listening to political or news radio/TV even when I might agree with the hosts because of how inane the conversation are -- even compared to sports blowhards! No one can dispute that fact that the U.S. has gone from creating chaos abroad to creating chaos at "home," all with the same arrogant belief and hubris that chaos can be managed. The fiscal chaos alone is amazing. The government claims to have passed a budget. However, the domestic budget is separate from the military budget. According to MSM (which means that things can only be much worse than reported), for 2018, the U.S. will be running the country with the largest deficit ever -- $666-billion. Besides being a rather arbitrary, spooky, and biblical number, either alluding to, or paying homage to the "number of the beast," this number serves as just another diversion from the fact that the military's budget, passed earlier in September, also saw a record increase -- $700-billion dollars. I am sure that there is room for adjustment on both sides. Maybe these kinds of antics can go on forever, and maybe they can't. I am convinced, that as former President Ronald Reagan was partly responsible for the fall of the Soviet Union by out-spending Communist Russia into the grave, the world will bear witness as the U.S. government, under President Donald Trump spends itself into oblivion. I can hardly imagine what the death of a whole economy looks like, or for that matter how a premier, first world economy becomes a banana republic, or worse, overnight. Worse being how this fate may all be guaranteed -- all be part of the plan. Just a continuation of managed chaos. The only Statesman in the World today - truly deserving of all that that description entails. Graciousness, balance, perspective, courage, vision, intelligence, insight and most of all, integrity and compassion. Edgar Cayce said - in a trance, and way back when - that the light of world in the future comes from Russia - and not via Communism. I think maybe he somehow saw this - and it gives so much hope. Also, with those young people Putin referred to who were at Sochi and other other events lately involving young people who are all demonstrating a desire to get rid of the old, stinking past of Demon Capitalism and embrace new more humane and balanced ways of thinking, I am reminded of Ron Paul who has said he has found the same thing in so many of the youth on American Campuses. Again - it gives us great hope. To be embarrassed, you have to first be aware of your indiscretions. Americans, on the whole are clueless as to the chaos created throughout the world in their name. To be uninformed is to not hold guilt. Worked out well in the 30s in Germany. Dmitry you have done it again! I, unlike you, was born in this sometimes wonderful, sometimes dreadful place and have been trying to figure it out since. Your lens may be cleaner than most americanos' and is lacking all the various filters we use to see what we want to see when we assess our surroundings. it takes a long time to remove all these so one can see clearly and the view is so extreme, our eyes hurt and we generally put something wooly and warm back over the lens just to preserve our eyesight. I thank you for sharing and hope others here catch a glimpse of what is real as our little red wagon is rolling down the hill pretty fast now. For a long time I wondered why our people would tolerate this stuff and keep lining up for more. It took a reading of Morris Berman to get me to see what it is about us that makes it all work. Is this correct? "Meanwhile, the chemical weapons arsenal stockpiled by the Soviet Union is enough to destroy life on the planet multiple times over." Should that be "...by the United States are enough...."? I hope Edgar Cayce was right, btw. He also said very positive things about China. I am somewhat surprised at all the praise lavished on someone who has committed himself to serving the needs of the Technosphere. His speech clearly shows a lack of true vision regarding the future of mankind, and what we are most likely to reap by embracing and incorporating ever more technology into our lives. Did no one notice all the handheld gadgets that the youth at Sochi were holding up in the air as they marched around? Do we really need more technological integration? I can still remember a time when all that was not necessary, especially the narsissitic trend of filming and photographing oneself constantly and wherever one goes. I miss a time when you could speak face to face with others without someone barging in to photograph the moment, and thereby trivializing it and sucking all meaning out of it. Do they go back and review all their selfie’s and movies of themselves? What exactly is the purpose of all this technological activity that our youth are immersed in? I don’t mean to downgrade all of Putin’s achievements, of which there are many, but I don’t see him as some kind of human visionary. This is a man who, after all, referred to Henry Kissinger as “an old friend”. I would advise others to be more careful of whom they designate as a visionary or someone who will show us the light at the end of the tunnel. Acting like an adult is not a ticket to visionary status— even in the current political climate, which, if you read history, has been repeated many times before.
" There can be no separate futures for us, at least, not in the modern world. So, the responsibility for ensuring that this world is conflict-free and prosperous lies with the entire international community. " Greenhouse gas accumulation is global, impacts of warming are location dependent. Many peoples futures will become very separate from others. Permanent carrying capacity limits are way over-shot, and the carrying capacity is declining. Prosperity when equally distributed is in conflict with population. Mutual Animosity and conflict, and resource benefits of exploitation are actually all that is holding the bigger national/empire components together, as external forces between them, including Russia. This actually is an important invisible interdependence. Who would we be without our enemies? The speech actually attributes US achievements to Russia events, but everyone is watching everyone else. I think that Putin would agree with you. For example, until recently any country that tried to trade oil for anything other than US dollars got bombed by the US (and friends) and had their leader assassinated. But times change and empires go bankrupt and dissolve. Now the US is increasingly powerless to stop anyone from walking away while Russia manages to maintain friendly relations with countries that have traditionally considered each other enemies, such as Iran, Saudi Arabia and Israel. The point is, there is more than one way to play this game, and it doesn't necessarily have to end in defeat for any side.